Planting Bananas can go in the ground in full sun, or in a container until the outside temperatures are warmer and more consistent. Bananas are happiest at 75°-90°F. When you plant them in the ground, water them well the first time then keep them moderately moist with good drainage. Plant multiple bananas about 8 feet apart in a row. If possible, add a drip irrigation line to keep them moist. Fertilizer Once new leaves begin to appear, you can begin to fertilize your plant. 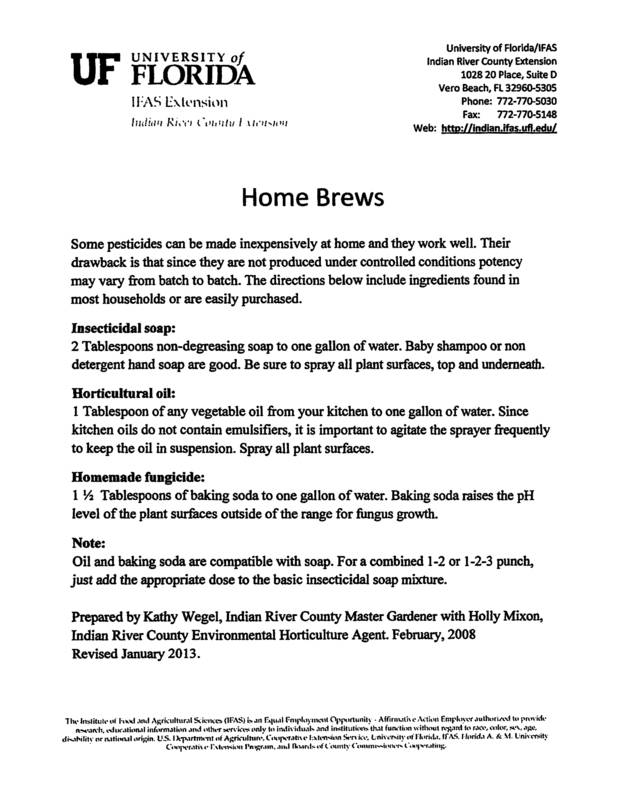 If kept in a large container you can used diluted 20-20-20 in the water once a week. When they are in the ground, after any danger of frost has passed, you may fertilize with any good general fertilizer, ideally one with high potassium content. Don recommends BANANA BLEND (6-2-12). If this is not available, you can use whatever is close to these numbers or blend 1/3 pound 0-0-20 with 2/3 pound of 6-6-6. First fertilizing, use a handful. As the plant grows, gradually add more each month until you apply approximately 1-2 cups monthly and increase to 3-4 cups monthly as more growth occurs, they are close to maturity, and there is more than one stem in the mat. Continue this as long as you are growing bananas. You will see dramatic results with your plants. Regular monthly fertilizing will maximize the amount of fruit. The banana fruit actually develops underground before the new pup sprouts, so if they have been starved, there will be very few bananas. Generations Each stem will produce fruit and then die. Before that happens additional side shoots (pups) will appear. How many and how often varies with the cultivar. You should have 3-4 generations at most in a mat. Once there are more, dig up extras and start a new mat. Each root system can only support that many stems. More will divert energy from making fruit. Commercial growers often remove all suckers to maximize fruiting. The best new sprouts are sword suckers. These have very narrow sword shaped new leaves and a thick stem. They are closely attached to the mother plant and grow really fast. The other type is called a water sucker. It has a thin stem, and broad mature looking leaves. They often appear some distance from the mother plant. Because they are not so well connected, they grow slowly and will take a long time to fruit. More likely, they will only produce sword suckers which in turn grow up and fruit. Mulch As older leaves die, cut them off and leave them as mulch around the base of the plants. After a stalk fruits, cut off all but the bottom 4 feet, and cut the rest into 1-2 foot sections and leave as mulch at the base. This will provide additional fertilizer as they break down. After a couple of weeks, cut the 4 foot section down to ground level. The layer of mulch and compost will also discourage root feeding nematodes and encourage beneficial nematodes that eat the root feeders. Pests There is a fungal disease, Sigatoka, that affects banana leaves, turning them brown from the outer edge in. 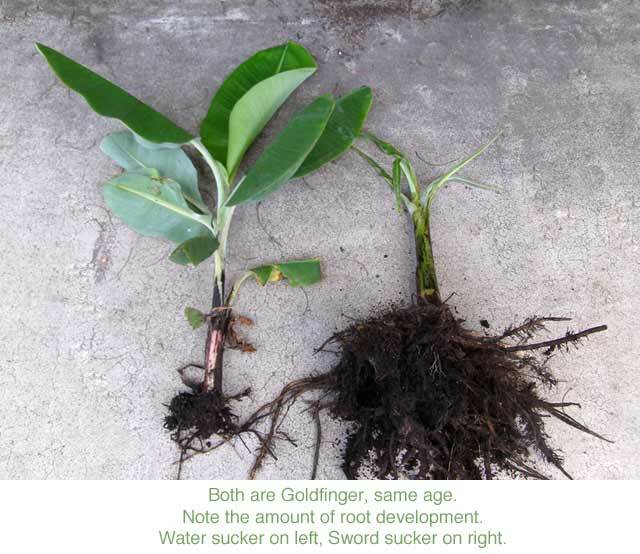 This disease saps energy from the plant, so remove any part of the leaf that shows signs. Keep as much of the green leaf as possible since that is the solar energy panel for the plant. Keeping the mat thinned and the dead leaves trimmed helps with air circulation which reduces the spread of the fungus. Another pest is the banana weevil. You should not have a problem with them in a dooryard situation unless they arrive with contaminated plants. Inspect the base of new plants for infestation. Rack Once you get fruit, the bunch takes several months to mature. When the bananas get plump (the sides bulge out rather than being flat and angular) and you see the top-most bananas blushing yellow, the bunch can be cut down. Wear your banana clothes when you cut bananas. The sap may be clear but it will dry dark brown and is permanent. Frame Make a frame in the shade to hang the banana bunch upside down outside. That way the breeze can blow away excess ethylene gas, which would otherwise hasten ripening. You don’t want the entire bunch to ripen the same day, which it will do if you bring it inside and sit it on a table. Hanging the bunch upside down keeps the bananas from levering themselves off the stem as they ripen and get softer. Leaving the fresh-cut bunch outside also keeps the sap from dripping and staining anything. Cut apart the hands and rinse in 10% bleach water any you do not use immediately. Flower stalk Whether or not you cut the end of the flower stalk off once it stops making new bananas doesn’t seem to matter. In some cultures, people prepare the flowers to eat. Ask your Indian friend. 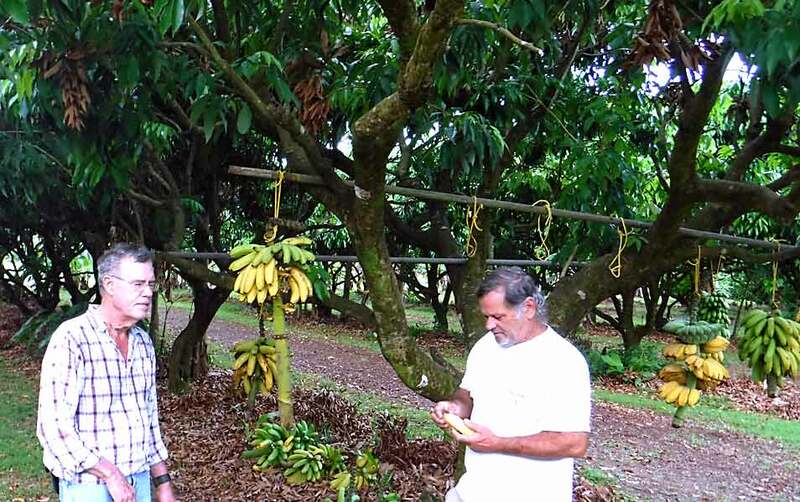 Harvesting For short banana varieties, you can fairly easily cut the bunches down. For tall varieties, the easiest way to get a large bunch down is clear an area on one side, make an almost vertical cut part way through the stem on each side creating a hinge facing the clearing, then push while guiding the top part down. Cut through deep enough it will bend down slowly with some pressure, but not so much that it just falls over. . .
Use a sharp machete, or a saws-all with a long tree trimming blade. Remember, once a pseudo-stem fruits, it will die anyway. Re-read the mulch section above. See Dr. Crane’s tips, banana section.